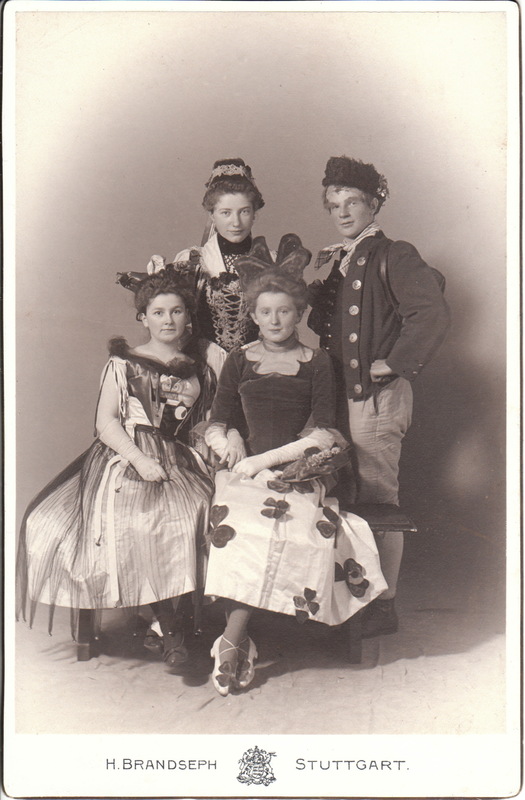 A young man and three young woman dressed in ethnic clothing, or theatrical costumes, pose at the H. Brandseph studio in Stuttgart, Germany. The foursome are attractive, and they appear to be teenagers. Perhaps they are stage performers. Printing on the reverse of the cabinet card reveals that Hermann Brandseph’s Stuttgart studio was located at “Marienstrasse 36”. A telephone number is listed for the studio which demonstrates that this photograph was produced toward the end of the cabinet card era. Hermann was the son of well known German photographer Georg Friedrich Brandseph (1826-1915). Georg was a lithographer, silhouetter, and painter who learned about the daguerreotype process from the celebrated photographer Karl Reutlinger who lived in Stuttgart (to view a number of Reutlinger’s photographs, click on cabinet card gallery category “Photographer: Reutlinger”). Georg opened his own studio there in 1853. In the 1870’s the Brandseph studio was extremely successful. In fact, by 1870, the studio had 40 employees. Georg turned the studio over to his son Hermann (1857-1907) in 1884.